Individuals are increasingly turning to computermediated communication in order to get information on which to base their decisions. For instance, many consumers are using newsgroups, chat rooms, forums, e-mail list servers, and other online formats to share ideas, build communities and contact other consumers who are seen as more objective information sources (Kozinets, 2002). These social groups have been traditionally called virtual communities. 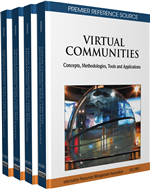 The virtual community concept is almost as old as the concept of Internet. However, the exponential development of these structures occurred during the nineties (Flavián & Guinalíu, 2004) due to the appearance of the World Wide Web and the spreading of other Internet tools such as e-mail or chats. The justification of this expansion is found in the advantages generated by the virtual communities to both the members and the organizations that create them.